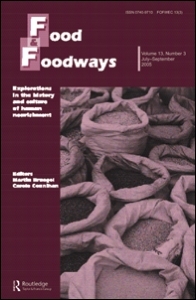 I just got a copy of the most recent volume of Food & Foodways. This special issue was guest edited by SAFN member John Brett and Culture & Agriculture member Lisa Markowitz. For those of you interested in food policy and security, this volume of Food & Foodways should not be missed. The articles largely come out of a double session of papers from the 2007 American Anthropological Association meeting in Washington, DC. These panels were organized by Tom Marchione who wanted these sessions on food security and policy to underline the social justice aspects of food systems. by Christine M. Du Bois, Chee-Beng Tan, and Sidney Mintz (eds. ), The University of Illinois Press, 337 pp. by Tomoko Aoyama. Honolulu: University of Hawaii Press, 2008. 274 pp.